Sometimes making a delicious Keto meal doesn’t have to be so complicated. Something warm and comforting like this Keto Bacon Cheeseburger Casserole can whip together pretty quickly, and even be something that the whole family can be please with. Feel free to top it off with your favorite hamburger toppings (keto-friendly of course). 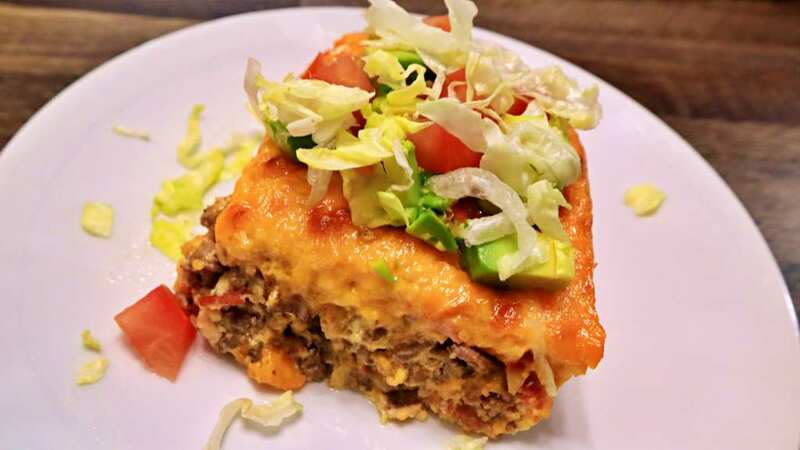 In addition to being a quick and easy Keto dinner, this Cheeseburger Casserole reheats really well too, making it a great candidate for leftovers and even meal prep. Just make a big dish like this recipe all at once and then separate your leftovers into single-serve containers for quick and easy reheating later. We highly recommend using Grass-Fed Beef if you can find it, but if you can’t or if you prefer to keep the costs down, regular 85/15 Ground Beef makes for a good substitution. The Grass-Fed Beef tends to be naturally leaner, so you probably wouldn’t want to use something fatty like the cheaper 70/30 ground beef that you often find in bulk. 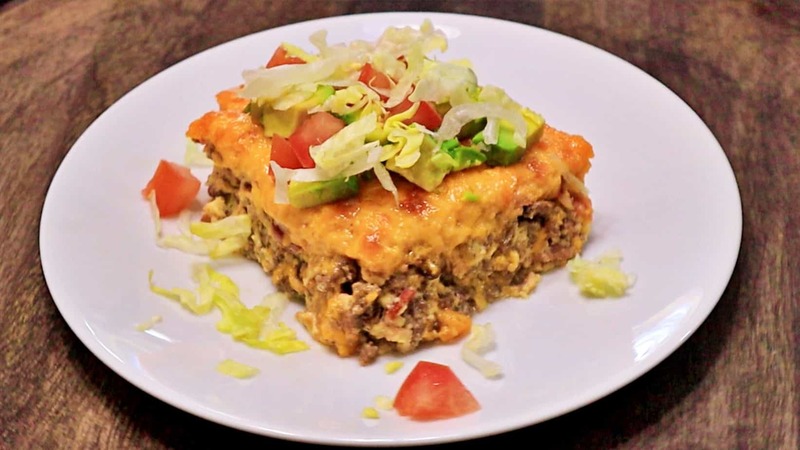 Let us know in the comments section at the bottom of the recipe what your personal twist on this Keto Bacon Cheeseburger Casserole would be! Start out by prepping your ingredients, which will include shredding the Cheddar Cheese, Cutting up the Uncured Bacon. Set the cheese aside for now. In a Large Frying Pan cook up the Sliced Bacon Pieces and set them aside. In a Large Frying Pan brown 2 pounds of Grass-Fed Ground Beef, and season it with 2 Cloves of minced Garlic, 1/2 Tsp Onion Powder, 1/2 Tsp Pink Himalayan Salt, and 1/4 Tsp Ground Black Pepper. When the Beef is browned all the way, add the Bacon back in and transfer it into a Casserole Dish. In a Large Mixing Bowl crack 8 Large Cage-Free Eggs, and add in 1 Cup Sugar-Free Salsa, and 1 Cup Heavy Whipping Cream and whisk together. Add about 2/3 of the Cheddar Cheese (8 ounces approximately) to the Egg Mixture, and incorporate well. Pour the egg mixture on top of the Beef in the Casserole Dish, but do not stir them together. It Works best as layers. Top the Casserole with the remaining Cheddar Cheese (4 ounces Approximately) and place in the oven to bake about 16 Minutes @ 350*F.
Keep an eye on the cheese, and remove from the oven when the Cheddar Cheese topping has a nice bubbly and crispy layer on the top. I use deer or moose meat as I know there is no additives to my meat. is the casserole dish size a 9×13 or 8×8 dish? It’s more than likely a 9×13 with 2 pounds of meat. That’s what I used .. And just to add flavor, I used the low sodium,low carb can of Rotel tomato’s. I like that better than salsa and it’s not as much sodium. I halved recipe and it worked well in 8×8. It’s very good! A 1/2 teaspoon for 2 pounds of G.beef with all the other ingredients listed is a very small amount. I’d be more concerned about the 60 grams of fat…of which 30 grams is unsaturated fat ….than a 1/2 teaspoon of Pink H salt…. Why is it so liquidy? I did everything! Most grocery stores carry it no around here, it’s in with the spices not right next to the salt at my store, have also gotten it out of bulk bins some places. What happens with the bacon? In the video the cooked bacon gets added to the ground beef after it is cooked. Several questions, what is booking the cut up bacon, is it flattening it? When do you cook the bacon ? When do you add it to the casserole? Thanks! I think it’s a typo for COOKING. Read #5. When to add. #5 tells you what to do with the bacon. The written directions say to cook bacon til done and add it back to hamburger meat. Then you just go from there with mixing the other ingredients to pour over the meat and cooked bacon.. Put bacon back in when beef had browned. No. 5 above. Read step #5 under instructions. It’s perfectly clear! 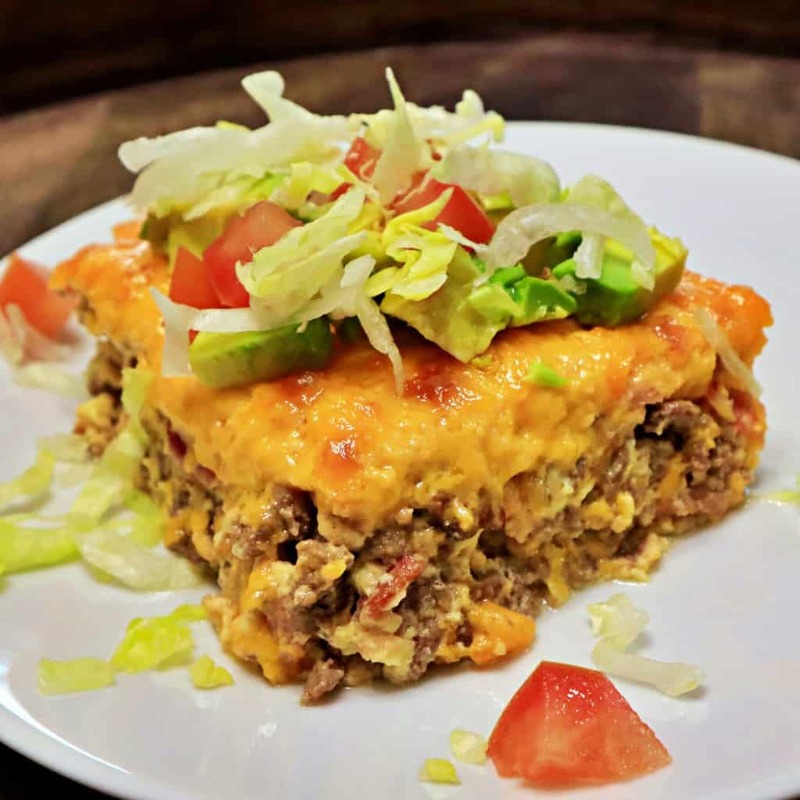 Keto bacon cheeseburger casserole recipe…..when do you add the bacon ??? What about the lb of bacon? This looks so yummy! I almost saved it, so I could make it later, them I saw the cholesterol. OMG! Already taking meds for high cholesterol. Food does not give you cholesterol. If you know about the Keto diet then you know that one of the benefits is that it lowers your cholesterol. It was good but the middle didn’t set up because there was too much grease even though I drained it really well. What was the fat content of the Beef that you used? Did you use Grass-Fed Ground Beef? There’s usually hardly any fat in that. like 7% Fat usually. I made this with regular ground beef per budget and just drained it really well then used paper towels and pressed extra grease out then ran it under hot water to clear off grease and it worked amazing (I use this all the time due to our budget) no grease in it whatsoever and it was absolutely amazing . Because I did the beef this way I waited to add the garlic, onion powder, salt and pepper until I had it in a bowl mixed the bacon (which I degreased the same way) and beef together in. First of all they do tell you in the Keto diet to NOT use the less greasy hamburger. They want you to use the 75% ground beef because it contains the good fat that is needed for the Keto diet. And this pink Himalayan salt may not be the right kind of salt for everyone. It does not contain the amount of iodine needed for daily consumption. Our bodies need a certain amount of iodine in order to function. If we keep striping minerals and nutrients from our food we are going to have a whole realm of bad things going on. Don’t go out and buy this salt just because the recipe has it as part of the ingredients list. You can use table salt, sea salt, kosher salt, any kind of salt you have on hand. That salt is extremely expensive. Don’t waste your money. This is what I wanted to do as well. I bet it cuts back some of the fat. If you’re following Keto , 70% of your daily intake should be fat! Updated the Instructions, thanks for pointing that out. If you read the recipe item #5 tells you when to add the bacon!!!!! After the hamburger is cooked!!!! I’m thinking one serving of this is really high in calories! It looks delicious but I just can’t do that many calories with one meal. Layer hamburger meat, bacon , eggs, whipping cream and cheese pour over top don’t stir. I didn’t add more cheese but you can. This was so delicious! We had to use self control in eating only one serving! The only thing I changed was was the cheese, I only had jalapeno cheddar cheese! Can’t wait to have leftovers tonight! Thank you! Is it really 830 calories per serving?! Yes, the dish is high in calories. I know I see avocado on top, yet you don’t list it. What can I use in pace of salsa? Can you tell me what type of pan you are using in the video? It looks granite with the 2 small handles. Mine too! It’s been in the oven almost 30 minutes, I just raised the temp and set the timer for 10 more. Fingers crossed….everyone is waiting on dinner!!! Same! The time needed to cook this is way longer than 16 minutes. It took over 30 minutes to fully cook the casserole .Next time I will dr as in the salsa too. What kind of cookware is used in this video? I was going to 1/2 this recipe, as I cook for one. Has anyone tried that yet? I made a half recipe. It turned out great. I just cut the ingredients in half. I cook my hamburger in a plastic strainer in the microwave. All the grease goes into a bowl below the strainer. That is the first I have ever heard of it being cooked that way! What percentage of Fat was your Ground Beef? This was yummy… Could drain some liquid off the salsa I used 😍 But was really yummy! I used the Costco hamburger and drained of drippings before adding he bacon . Can’t wait to try it! Think I’ll use ground turkey for a little less fat and add chopped onion and bell pepper. Made this tonight and everyone loved it! Very easy to make and the variations you could do are endless! I made this for dinner tonight. I have been eating KETO since October w/ a few cheats over the holidays. I did not have whipping cream so I substituted sour cream w/ a little bit of whole milk. I topped it w/ avocado and sour cream. Very yummy!! It seemed to take a little longer to cook though. I set it at 350 and I checked it at 16 minutes as the directions say. I think it wound up staying in the oven for about 55 min. – checking every 5 minutes past the 16 min mark. Then when I read it again, I thought ooops it was 30 minutes, but it still took almost an hour to set. Thank you for the recipe! I hate salsa any suggestions for substitute? Either omit it entirely or sub with maybe 1/2C of Sugar-Free Ketchup or Thousand Island Dressing? Can I make this the day before and bake it on the day I will serve it? This recipe is amazing. BUT there are some things you must take into consideration. First of all I will tell you I have a gas over. Now on to the adjustments. You need to keep in mind the cheddar cheese has it’s own “grease” so with that in mind, If you are using beef that is more than 7% fat, DRAIN the beef , leaving about 2 TBSP of fat, BEFORE adding the drained bacon to it. When baking the casserole, it will take more than 16 min. This is why some of you have had a “gooey” center. I baked mine for about 30-35 min. It came out PERFECT. It’s flavorful and juicy. I will be making this again!! I made and took this out of the oven after 16 minutes… eggs were still runny.. I put it in for an additional 15 minutes! So we will see!! I’m sure it’s delicious!! Maybe try an egg substitute? I just made this. Must have had too much liquid as it never did set up completely even after baking for 45 minutes. It was good, not knock your socks off great. I will make it again with a few tweaks. Delicious and do bake 30 minutes in a 9×13 dish! Could this be done without the egg? I made this the other day, didn’t like it but it did taste better the next day. I cooked it the way it said but it came out to watery. Did I not cook it long enough or was it suppose to sit for a while. Why does this recipe have so much sodium in it?? So incredibly good. Will be making this a lot. Made this last night. It was perfect for my family who is on a low carb diet. The recipe is exact and the casserole got rave reviews . I had no problems. I baked it in a convection oven and it was done through and through. I am totally in agreement with this keto recipe. It is delicious. Reason for this post: I am very interested in the make of the fry pan (double handle).. WHAT MAKE IS IT? My hands aren’t what they used to be and I am constantly looking for two handle fry pans.. Can anyone help me? if cast iron is not too heavy, you might check with Lodge, they will have a few with double handles. I just made this and I had to cook it 30 minutes at 375 degrees it taste great, but if I was to make it again I would use Rotel Tomatoes instead of the Salsas . I added more hot Salsas to mine. I don’t use Ketchup or Mustard on anything I eat. SO. I made this yesterday… and at first… I was a little disappointed. I tasted like a plain hamburger with a mild bacon flavor…… and then…. I added to condiments…. and WOWERS… what a difference. My boys ate it like crazy… before I even served it for dinner!!!! My recommendations: be aware of the salt level of the bacon and salsa… .I used uncured and fresh salsa and it needed a little more spice. I put mustard, mayo, extra cheese, pickles and ate it inside of two leaves of lettuce… BAM!!! After a hard night at the gym this meal really satisfied. can someone please tell me what kind of cookware is being used? I follow a Keto plan so the fat content doesn’t bother me. It’s the protein. Your thoughts? I made this for my non-Keto family and they loved it! I used a seasoning mix in place of the salt, pepper, onion salt…really good, but we needed to add salt. After the recommended cooking time, the eggs were still not set so I turned the oven up to 400 and cooked 10 more minutes – perfect! Thank you for a great, delicious recipe! I made it like a “taco casserole” by adding taco seasoning instead of the recommended spices. I also only had “Chihuahua” cheese on hand and it turned out delicious. I added 15 minutes to the cooking, however I think because my pawn was larger it came out a little thinner, great nonetheless. Are there any substitutes for the salsa? Or has anyone tried without? Would like to make for dinner tonight, just missing salsa… thanks! Awesome recipes! Where can I get the pan used in the video, and those cool dishes . Hi Keith we bought that pan at Home Goods. Absolutely delicious. Once I put other hamburger items on it, it was perfect! Thanks so much for this great recipe! Special sauce.? You know??? What the heck??? I made this tasty pie omitting the salt as I thought the bacon and cheese would make it salty enough, which it did. This is a keeper!! Made this with rotel and it was good. Had to up temp to 375 and cook for 5 more minutes then left in oven to set. The difference may be I whipped the eggs a little and measured the grated cheese by weight rather than volume so it really sucked up the eggs. Added chow-chow as a condiment and that little tang really lifted the flavor! Will make it again and experiment with some of the other ideas. It took 60 minutes to cook this meal! Hope it tastes as good as it looks. Can we use Mezzetta’s Marinara sauce instead of Salsa? WHIPPING CREAM, CHEESE, EGGS, and BACON….and you are worried about the FAT in grain-fed vs Grass Fed BEEF???? BA HA HA HA HA!!!!! !